Bugs, possibly leading to security flaws, are inevitable in the extremely complex modern processors.Some of such bugs may be later fixed in the field by patching processor firmware. 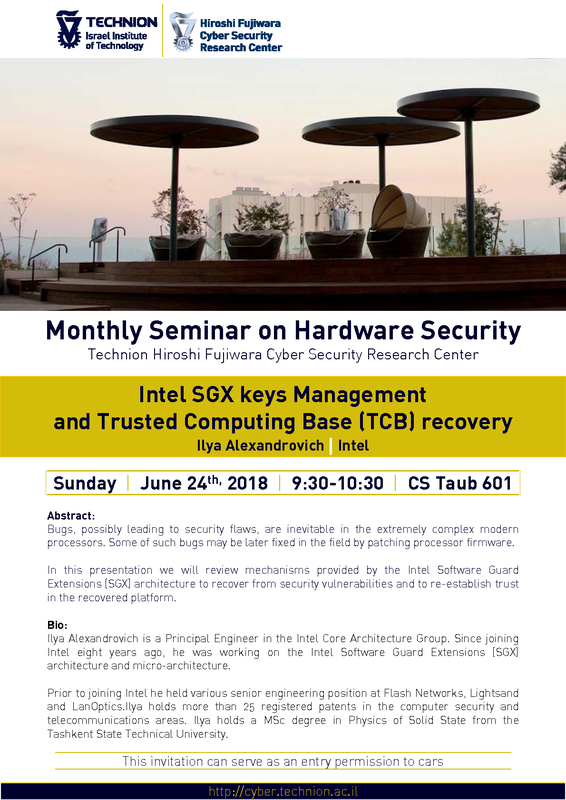 In this presentation we will review mechanisms provided by the Intel Software Guard Extensions (SGX) architecture to recover from security vulnerabilities and to re-establish trust in the recovered platform. Ilya Alexandrovich is a Principal Engineer in the Intel Core Architecture Group. Since joining Intel eight years ago, he was working on the Intel Software Guard Extensions (SGX) architecture and micro-architecture. Prior to joining Intel he held various senior engineering position at Flash Networks, Lightsand and LanOptics. Ilya holds more than 25 registered patents in the computer security and telecommunications areas. Ilya holds a MSc degree in Physics of Solid State from the Tashkent State Technical University.